In The Recycling World, Why Are Some Cartons Such A Problem? : The Salt Because of layers of material that can be difficult to separate, many containers for juices and broths have traditionally been destined for landfills. But recycling them is getting easier. Because of layers of material that can be difficult to separate, many containers for juices and broths have traditionally been destined for landfills. But recycling them is getting easier. Aseptic cartons pack several environmental upsides, with one big catch: Traditionally, these containers have been quite difficult to recycle. To take stock of the promises and challenges of this supermarket sensation, I talked to experts on all things carton. Like any enigmatic celebrity, the aseptic carton has layers. Though lightweight, the exterior is composed of multiple coats of paperboard, plastic and aluminum. This type of carton has been around since the 1950s, according to Pelz, but for a long time was limited primarily to milk cartons in countries without refrigerated shipping. The aseptic carton "has lots of environmental advantages," says Darby Hoover, a senior resource specialist with the Natural Resources Defense Council. "It's lightweight, and it typically doesn't need to be refrigerated [until opened]." Lightweight packaging requires less energy to ship than heavier material. The packaging versus product ratio — seemingly the packaging industry's analog of dress measurements — is a dainty 7 percent packaging to 93 percent product by weight. By comparison, a steel can's ratio is 13 percent packaging to 87 percent product. The carton's rectangular shape allows for close packing in transport, according to Pelz, which makes shipping more efficient. The shelf-stable cartons can also prevent food spoilage. Alas, the aseptic carton has a tragic flaw. "There's a real challenge in trying to recycle it, because you have all these materials that are essentially glued together," explains Hoover. Aseptic cartons aren't the only type to face such challenges. The "gable-top" milk carton — a paper-based container plenteous in elementary school cafeterias — also has paper and plastic layers that are difficult for many recycling plants to separate. 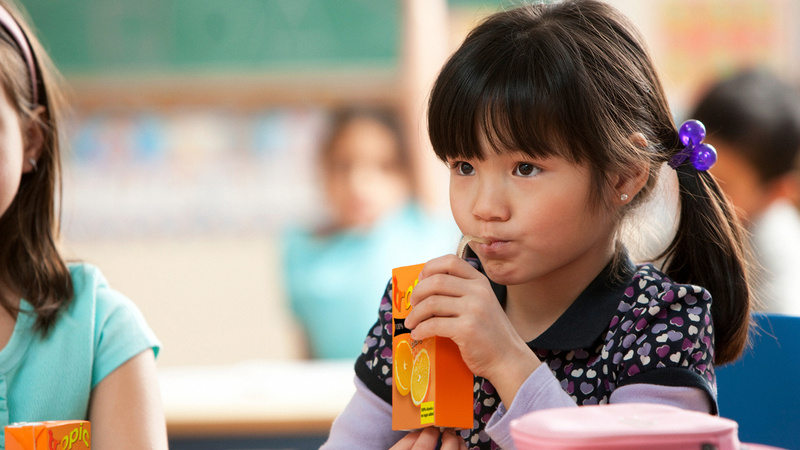 In recognition of these difficulties, the Carton Council formed in 2009 to increase recycling capabilities for both aseptic and gable-top cartons in the United States. Some countries that have already widely adopted aseptic cartons can offer examples of how to recycle the containers. Pelz says that in Mexico and Brazil, cartons are sometimes turned into pellets for building materials ranging from tiles to flower pots. In the United States, many recycling centers have begun to accept the cartons. In most cases, the plants strip the fiber from cartons and recycle it, but they do not necessarily recycle the plastic or aluminum components. That said, at least one company is offering a more complete recycling package. The Iowa-based ReWall Co. shreds whole cartons at a paper mill and smashes the carton scraps in what Pelz describes as a "giant panini press" into boards that can be used for roofing, siding and other building projects. When the Carton Council was founded, only 18 percent of households in the U.S. had access to carton recycling. That number has jumped to about 62 percent. The trick is learning what the recycling rules are in one's own community. "I live in Oakland, and I work in San Francisco," says Hoover. "The things you can put in the recycling bins in those two adjacent cities are not the same." In general, Hoover recommends looking at city or public works websites for recycling guidance. For cartons, the council has created a website that allows searching for carton recycling capability by city or ZIP code, and reporting areas that do not yet have service. Both Pelz and Hoover say they hope that progress continues to be made in recycling cartons. That will help process additional aseptic carton products that may be on the way. Boxed wine, anyone? Natalie Jacewicz is a science writer based in New York City. You can find more of her work here. Gnawing Questions is a semi-regular column answering the food mysteries puzzling us and our readers. Got a question you want us to explore? Let us know via our contact form.